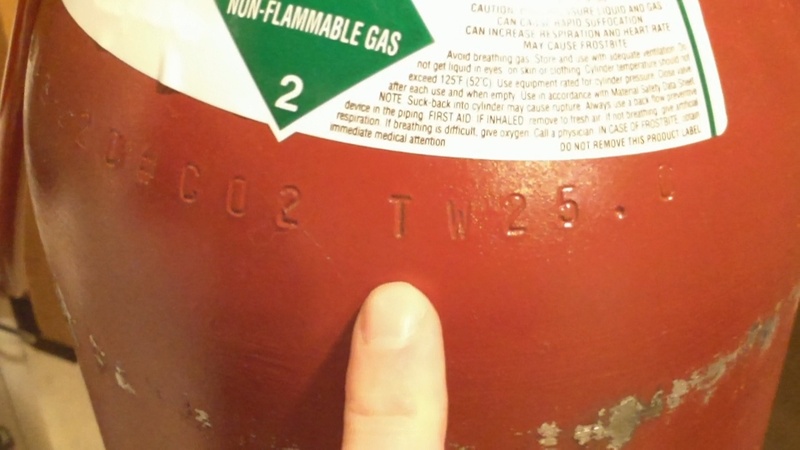 How Much CO2 is Left In Your Kegerator's Tank? How do you know how much CO2 is left in your tank? I’ve been pushing my luck on how much is left in mine, and I want to know how many more brews I can force carb and serve before I need to fill it up or trade it in. The TW (or Tare Weight) will help you determine how heavy your tank is (mine is 25.0). Now I just have to weigh it on the scale and subtract 25.0, leaving me with how many pounds of CO2 are actually inside. This is much more accurate than simply looking on your pressure gauge since that can fluctuate with room temperature changes. I suggest using a digital scale to get the most accurate reading. I know I’ve been pushing my luck on how much CO2 is left in my tank before I go trade it in or fill it up. It’s pretty low, but I’m still holding pressure. If you want to know how much is left in the tank that is more accurate than your gauge, first look for the TW on the tank. TW stands for tare weight, and it tells you what the weight of the cylinder is. Mine happens to be 25.0 lbs. So now all I have to do it put my tank on a scale and see what it weighs. Then, subtract 25.0 from that number, and that is how much is left in the tank. 00:50 I used an old giant household scale because it was all I had, however if you have something digital and smaller I suggest using that for a more exact reading. A little under 27.5 lbs is what my tank ends up weighing. So I take 27.5 lbs and subtract 25.0 lbs from it and I’m left with about 2.5lbs in my tank. 1:19 Another thing to note is that this is a 20lbs cylinder, so next time I exchange or fill my tank, the first thing I’m going to do is weigh it and mark that value down to see if I always get 20lbs or not. At least I now know I have enough CO2 to get my next beer kegged and clear the head space. That will give me enough time to fill the tank before serving.